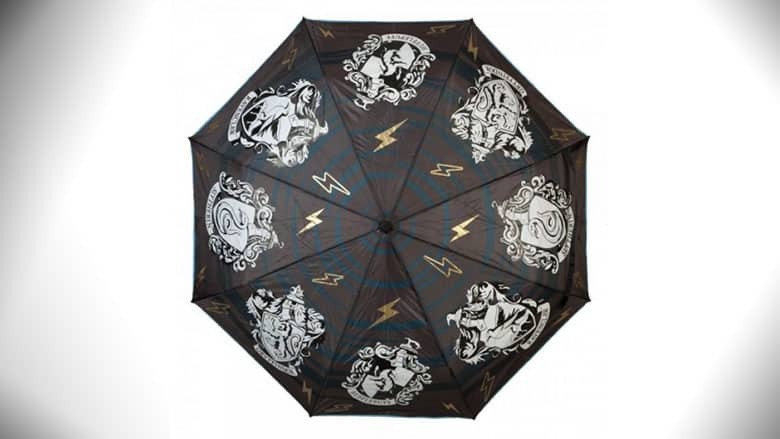 Harry Potter Color Changing Umbrella | Nerd Much? Bring a little bit of magic with you when you are out in the rain with this Harry Potter: A Touch Of Magic Color Changing Umbrella. At only $21.99 (in Muggle dollars!) you won’t need to worry about hitting up Gringotts to fund your fashionable waterwear. Also, unlike the Sorting Hat at Hogwarts only letting you into one of the famous houses, all four houses are on display on this color changing umbrella. That’s Show off the Gryffindor, Slytherin, Ravenclaw, and Hufflepuff emblems all at the same time. The umbrella uses Liquid Reactive Technology so change the color of the fabric when wet. When dry your umbrella is in elegant black, white, and gold, but when you take the umbrella out in the rain that is when the real magic happens. Each emblem bursts into magical, bright colors. The umbrella has a compact design, so it is incredibly portable and even comes with a nylon sleeve, so you can protect the surface of the umbrella when not in use. The handle also includes a wristlet, so you can secure your umbrella to your wrist on the off chance any ill-winds come your way as you’re out and about. 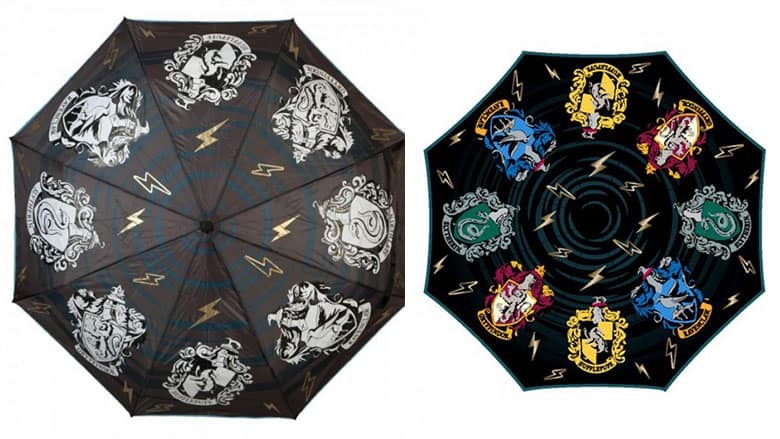 The Harry Potter: A Touch Of Magic Color Changing Umbrella is highly affordable at only $21.99, so be sure you order your own magical charm against the rain. 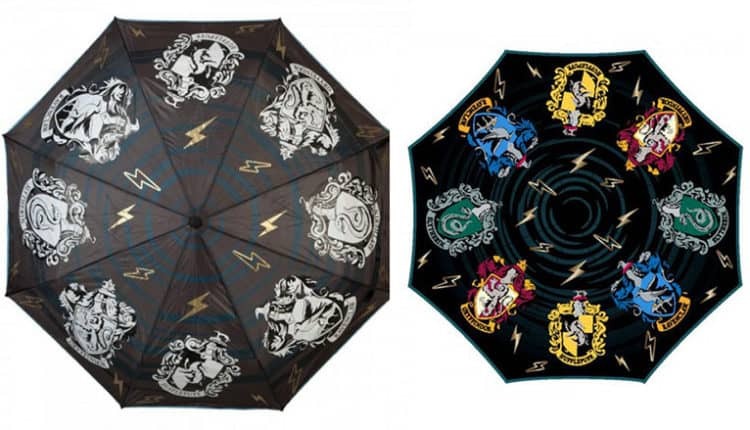 As for you Canadian wizards, as of right now you’re out of luck as Merchoid cannot make the Harry Potter: A Touch Of Magic Color Changing Umbrella available to your part of the Wizarding World. Perhaps some luck potion might help get that sorted? Hey, you’re magical… you can come up with some way to get one. As for you American wizards, Merchoid is a British company, so currency-conversion does apply. You’ll have a generous 100-day return policy though, according to Merchoid. So, no need to worry about setting up a remembrall to remind yourself to get it returned in time in case you aren’t satisfied with your umbrella. Want more cool Harry Potter stuff? Check out our hub of ridiculously cool stuff to blow your rent money on.